Nova was NASA's ultimate launch vehicle, studied intently from 1959 to 1962. Originally conceived to allow a direct manned landing on the moon, in its final iteration it was to put a million-pound payload into low earth orbit to support manned Mars expeditions. It was abandoned in NASA advanced mission planning thereafter in favor of growth versions of the Saturn V.
Before there was Saturn, when it was still known as the Juno V, there was - NOVA. The US Air Force had begun development of a 1.5 million pound thrust engine, the F-1, in the 1950's. 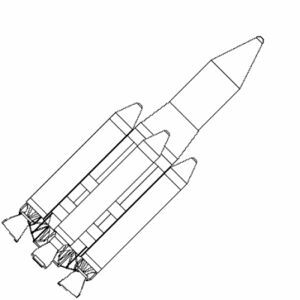 When NASA was formed, it considered a new launch vehicle beyond the Saturn, using the F-1 engine and capable of sending a manned expedition to the moon. This launch vehicle was identified as Nova in NASA's first long range plan, delivered to President Eisenhower on January 27, 1959. NASA, Von Braun's team at Huntsville, and major aerospace contractors conducted a number of design studies of Nova from January 1959 to June 1960. A common characteristic was the clustering of modular units consisting of an F-1 or J-2 engine and their associated propellant tanks. 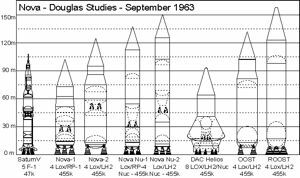 The first Nova designs used four F-1's in the first stage and had a translunar payload of only 24 metric tons. Once the three-man, 5 metric ton Apollo capsule was settled on, payload for a direct landing on the moon increased quickly - first to 45 metric tons, then finally over 60 metric tons. The number of F-1's in the first stage correspondingly increased to 8 or 9. In April 1961 President Kennedy set a national goal of a manned lunar landing before 1970. As NASA and its contractors scrambled to make the necessary decisions to reach this goal, it was felt that Nova, which would require construction of new manufacturing facilities, could not be developed in time to meet the deadline. Instead a member of the Saturn family, would have to be used. It was initially planned that two Saturn C-3's (three F-1's in the first stage) would put the Apollo spacecraft and its translunar boost stage into earth orbit. After docking and fuel transfer, the combined spacecraft would set off for the moon. Eventually lunar orbit rendezvous was selected as the landing mode, resulting in a single Saturn C-4 launch to send the Apollo spacecraft and lunar module toward the moon. At the last minute an extra F-1 engine was slid in �for insurance' and the Saturn C-5 was the configuration that went into production. The dimensions of Saturn were limited by the mundane realities of the ceiling height and bay lengths of an existing factory at Michoud, Louisiana, where the Von Braun team intended to build the S-IC first stage. Ironically, the Saturn V as it eventually flew was of essentially the same lift-off mass and payload capability as the Nova! Despite the selection of Saturn in 1961, studies on Nova continued into the middle of 1962. 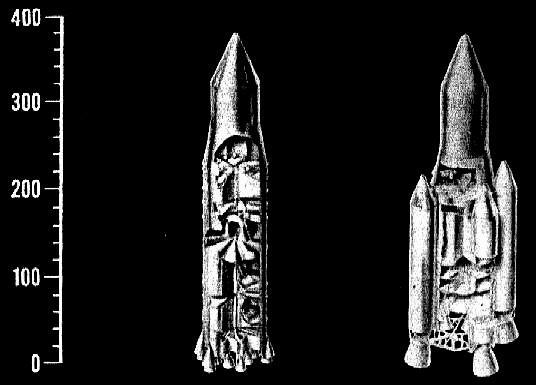 There were those at NASA headquarters who advocated using large solid rocket motors in place of an F-1 liquid fuelled first stage. They were sure these could be developed in time for the deadline, allowing the use of Nova to launch a direct landing mission to the moon. The first Nova did not finally die until the great �mode debate' was settled in June 1962 with the selection of lunar orbit rendezvous for the landing method. This marked the end of consideration of Nova designs dedicated to launch of a direct-landing Apollo spacecraft. Martin handed in the most comprehensive study, with all possible combinations evaluated, and advanced concepts such as plug nozzles and air augmented engines being considered. General Dynamics had the most conservative designs, using existing engines or enormous conventional bell-chamber engines in the 3 million pound thrust class. Bono at Douglas characteristically was optimistic about achievable stage mass fractions and had designs with masses considerably less than calculated by the other two contractors. Another aspect of Nova was how to transport and erect such huge launch vehicles. NASA had already selected and purchased land for Nova launch sites north of the Saturn V's LC-39. Nova and others of its ilk essentially require transport by water from the factory to the launch site and launch from sea or at least seaside facilities. NASA had the Army Corps of Engineers study some ingenious launch facility designs using barges and water channels under the pad to move the vehicle into position. Because of the enormous sound that would be generated in a Nova launch, remote off shore or towed launch platforms were considered essential. One exotic concept was to launch Nova not from Cape Canaveral, but from launch tubes hollowed into the side of Hawaiian cliffs! By the end of 1963 NASA no longer foresaw any need for such huge launch vehicles. Saturn V studies had already begun which indicated that, using solid strap-on motors, the Saturn could deliver up to a million pounds to orbit without the need to build new vehicles or facilities. More importantly, most at NASA saw the follow-on to the Saturn V to be a reusable winged shuttle, which would land at air strips and be fully reusable. Nova was cancelled quietly in 1964. However throughout the 1960's visionaries like Truax and Bono continued to design and advocate very large or single stage to orbit designs like Sea Dragon and Rombus. 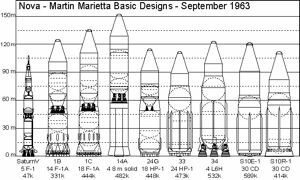 But in the absence of political support for human colonization of space or exploration of Mars, the need for such large launch vehicles has not materialized to this day. Nova NASA American heavy-lift orbital launch vehicle. The Nova vehicle most often illustrated in the popular press and histories. 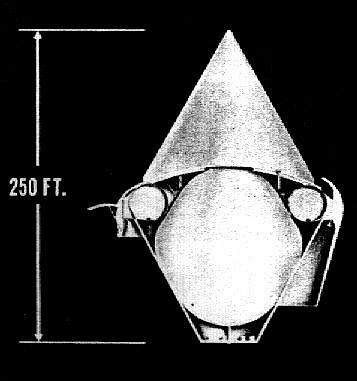 As in other early concepts, this NASA design of 1959/1960 used F-1 engine in both first and second stages. 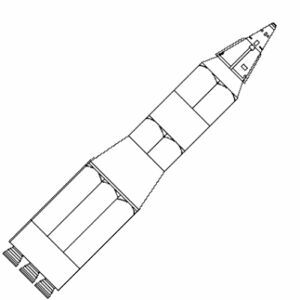 Resulting performance and total liftoff mass was equivalent to later Saturn V.
Nova B American heavy-lift orbital launch vehicle. Convair/Ehricke Nova design using standard tank/engine modules of 4.9 m diameter in both first and second stages; 6 F-1 engine/modules in first stage, 6 J-2 engine/modules in second stage. Nova C American nuclear orbital launch vehicle. 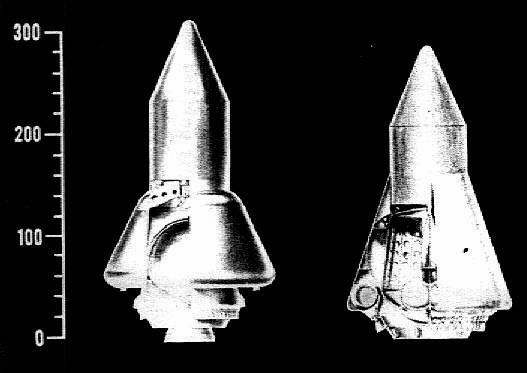 General Dynamics Nova vehicle using Nova A as first two stages, nuclear spacecraft with jettisonable tanks as upper stage. Nova 8L Mod American heavy-lift orbital launch vehicle. NASA Nova concept where first two stages use short Nova building blocks with 2 F-1's in each block. Four used in stage 1, one in stage 2. Typical of early Nova designs with F-1's in both first and second stages. Nova D American nuclear orbital launch vehicle. 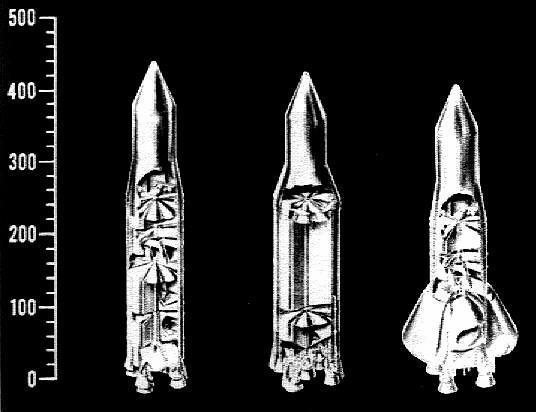 General Dynamics Nova vehicle using Nova B as first two stages, nuclear spacecraft with jettisonable tanks as upper stage. Nova 9L American heavy-lift orbital launch vehicle. NASA Nova design using clustered small diameter tanks; 9 x F-1 first stage and 4 x F-1 second stage; compared with solid Nova using five six segment solid motors in first stage and four four segment motors in second stage. Nova 4S American heavy-lift orbital launch vehicle. NASA Nova design using a cluster of 4 x 240 inch solid motors used as first stage; upper stages as Nova 7S and 8L. Nova 7S American heavy-lift orbital launch vehicle. NASA Nova design using a cluster of 7 x 160 inch solid motors used as first stage; upper stages as Nova 4S and 8L. Nova 4L American heavy-lift orbital launch vehicle. Earliest NASA Nova design, using only 4 F-1's, capability less than later Saturn designs. Nova A American heavy-lift orbital launch vehicle. Convair/Ehricke Nova design using standard tank/engine modules of 4.9 m diameter in both first and second stages; 4 F-1 engine/modules in first stage, 4 J-2 engine/modules in second stage. Nova 8L American heavy-lift orbital launch vehicle. Most capable NASA Nova design, studied in June 1960 just prior to selection of Saturn for moon landing. Used a three stage configuration of eight F-1 engines in stage 1, two M-1 engines in stage 2, and one J-2 engine in stage 3. Similar to the Saturn C-8 except in the use of M-1 engines. Unlike other modular Nova designs of the time, this one had the unitary stage construction of Saturn. Saturn C-8 American orbital launch vehicle. The largest member of the Saturn family ever contemplated. Designed for direct landing of Apollo command module on moon. 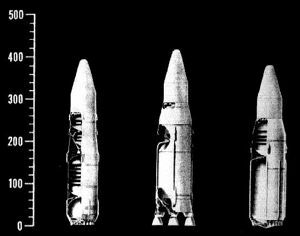 Configuration used eight F-1 engines in the first stage, eight J-2 engines in the second stage, and one J-2 engine in the third stage. Distinguishable from Nova 8L in use of J-2 engines instead of M-1 engines in second stage. Nova MM S10E-1 American heavy-lift orbital launch vehicle. Expendable single stage to orbit Nova using cylindrical shape, 24 CD module engines in zero-length plug nozzle. Operational date would have been October 1977. Nova MM S10R-1 American heavy-lift orbital launch vehicle. Reusable single stage to orbit Nova using cylindrical shape, 24 CD module engines in zero-length plug nozzle. Operational date would have been June 1978. Nova MM T10EE-1 American heavy-lift orbital launch vehicle. Two stage Nova using CD modules; expendable first stage with 18 modules exhausting to a 10% length plug nozzle; expendable second stage with 2 CD module engines. Operational date would have been November 1976. Nova MM T10RE-1 American heavy-lift orbital launch vehicle. Two stage Nova using CD modules; reusable first stage with 18 modules exhausting to a 10% length plug nozzle; expendable second stage with 2 CD module engines. Operational date would have been January 1977. Nova MM R10E-2 American heavy-lift orbital launch vehicle. Expendable version of most exotic Martin Nova variant; single stage to orbit, 30 cd module air augmented engines in annular shroud. Operational date would have been October 1980. Nova MM R10R-2 American heavy-lift orbital launch vehicle. 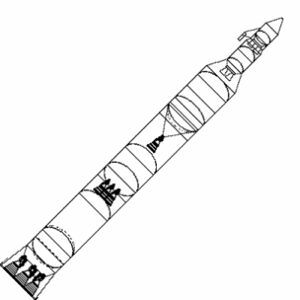 Reusable version of most exotic Martin Nova variant; single stage to orbit, 30 cd module air augmented engines in annular shroud. Operational date would have been October 1980. Nova MM S10E-2 American heavy-lift orbital launch vehicle. Expendable single stage to orbit Nova using conical shape, 30 CD module engines in zero-length plug nozzle. Operational date would have been November 1977. Nova MM S10R-2 American heavy-lift orbital launch vehicle. Reusable single stage to orbit Nova using conical shape, 30 CD module engines in zero-length plug nozzle. Operational date would have been July 1978. 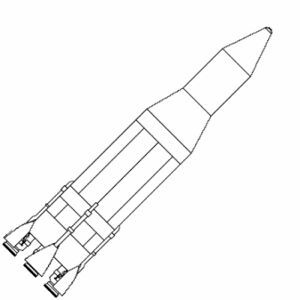 Nova MM T10RR-2 American heavy-lift orbital launch vehicle. 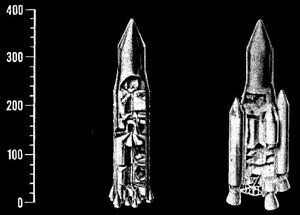 Two stage Nova using CD modules; reusable first stage with 24 modules exhausting to a zero length plug nozzle; reusable second stage with a toroidal plug nozzle engine. Operational date would have been December 1976. Nova MM 33 American heavy-lift orbital launch vehicle. Nova single stage to orbit design with 24 new high pressure LH2/LOx engines in the first stage in a plug nozzle arrangement. Operational date would have been April 1975. 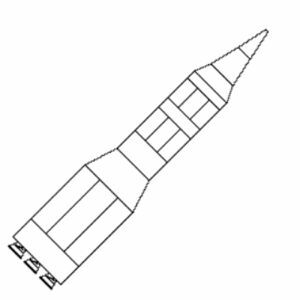 Nova MM T10RR-3 American heavy-lift orbital launch vehicle. Two stage Nova using CD modules; reusable first stage with 18 modules exhausting to a 10% length plug nozzle; reusable second stage with 2 CD module engines. Operational date would have been July 1977. 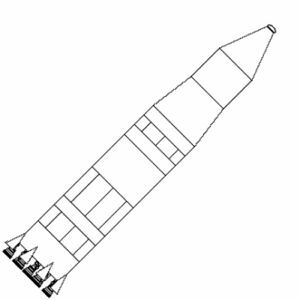 Nova MM 34 American heavy-lift orbital launch vehicle. Nova 1 1/2 stage design with 4 new 3 million kgf LH2/LOx engines in the jettisonable booster section and a single 3 million kgf sustainer. Operational date would have been June 1976. Nova GD-B American heavy-lift orbital launch vehicle. General Dynamics Nova design using existing engines. Recoverable engine package; separation at 3,398 m/s at 76,200 m altitude; splashdown using retrorockets under 7 30 m diameter parachutes 1300 km downrange. Massed estimated based on tank volumes, total thrust, and first stage burnout conditions. Nova GD-E American heavy-lift orbital launch vehicle. General Dynamics Nova design using 325 inch solid motors as first stage, M-1 engines in second stage. Recoverable solid motors, separation at 1,972 m/s at 53,000 m altitude; splashdown using retrorockets under 3 61 m diameter parachutes 610 km downrange. Recovery of solid motors foreshadowed same approach on shuttle 15 years later. Masses estimated based on tank volumes, total thrust, and first stage burnout conditions. Nova GD-F American heavy-lift orbital launch vehicle. General Dynamics Nova design using new 3.5 million kgf LOx/Kerosene engines in first stage. Recoverable stage; separation at 3,365 m/s at 89,300 m altitude; splashdown using retrorockets under 8 46 m diameter parachutes 1300 km downrange. Massed estimated based on tank volumes, total thrust, and first stage burnout conditions. Nova MM 24G American heavy-lift orbital launch vehicle. Nova design using new high pressure LH2/LOx engines; 18 in the first stage in a plug nozzle arrangement, 2 in the second. Operational date would have been December 1974. Nova GD-H American heavy-lift orbital launch vehicle. 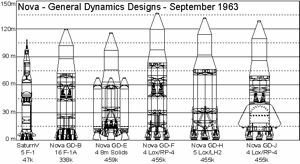 General Dynamics Nova design using 1 1/2 stage arrangement and new 2.4 million kgf LOx/LH2 engines. Recoverable booster 4 engine package would separate at 2,980 m/s at 87,800 m altitude; splashdown under 4 46 m diameter parachutes 1,000 km downrange. Massed estimated based on tank volumes, total thrust, and first stage burnout conditions. Nova GD-J American heavy-lift orbital launch vehicle. General Dynamics Nova design using recoverable LOx/RP-1 stage of ballistic shape with 3 million kgf engines; separation at 3,420 m/s at 93,900 m altitude; splashdown using retrorockets under 7 parachutes 1340 km downrange. Massed estimated based on tank volumes, total thrust, and first stage burnout conditions. Family: heavy-lift, orbital launch vehicle. Country: USA. Spacecraft: Apollo Lunar Landing. Agency: NASA. Bibliography: 16, 18, 214, 215, 216, 217, 27, 45. Cutaway view of General Dynamics Nova B and E concepts. 1961 June 10 - . LV Family: Nova. Launch Vehicle: Nova A. Preparation for NOVA rocket motor tests. - . Nation: USA. National Bureau of Standards broke ground for new research facility at Gaithersburg, Md., which will include a mega-pound deadweight testing machine to provide measurement standards for multimillion rocket thrust requirements..
1961 October 24 - . LV Family: Nova. 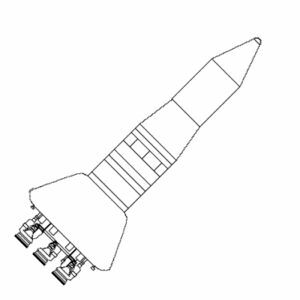 Launch Vehicle: Nova A.
Nova launch vehicle studies begun. - . Nation: USA. Program: Apollo. Studies of "unconventional" rockets using liquid fuels in the thrust range from 2 to 24 million pounds announced by NASA; 2 contracts being carried out by Aerojet-General and Rocketdyne Division of North American Aviation..
1962 April 24 - . LV Family: Nova. Launch Vehicle: Nova 8L. Delay in award of a Nova launch vehicle study contract - . Nation: USA. Program: Apollo. The Manned Space Flight Management Council decided to delay the awarding of a Nova launch vehicle study contract until July 1 at the earliest to allow time for an in-house study of bids submitted and for further examination of the schedule for a manned lunar landing using the direct ascent technique.